Judy Hoffman ’76, an artist in Brooklyn, N.Y., was one of four artists awarded a 2017 fellowship to develop new sculptural works at this internationally recognized center for ceramics. Criterion for acceptance is artistic excellence. Fellows receive a stipend, access to Greenwich House Pottery’s equipment and work areas, and inclusion in the exhibition Ceramics Now in the Jane Hartsook Gallery in Manhattan. 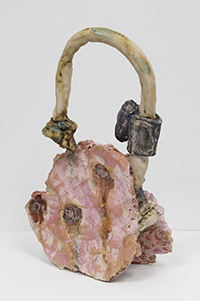 Hoffman builds visceral sculptures from clay, handmade paper, and urban debris that explore themes of decay, waste, and regeneration. Learn more about her work at judyhoffman.info.